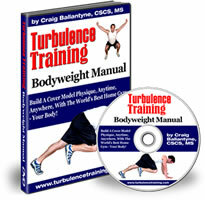 Core strength is the take away theme in Turbulence Training Day 15. Home fitness workouts that'll burn fat and sculpt your body in 4 weeks. Welcome to day 15 of Turbulence Training's Buff Dudes and Hot Chicks fat burning workout. "Hello and welcome to day 15 of the Buff Dudes and Hot Chicks workout, I'm Asad from Better4Fitness.com. It was the best Monday yet, the third one. It shows that I'm gradually improving which is really good to see because my lower body (legs especially, quads) have been really hard to build up in the past. So the fact that I'm seeing good improvements is a really big thing for me. The one thing that I noticed today, that I really felt it on my abs. Whereas the previous 2 weeks, I hadn't really felt it as much. That just shows that even if you think you know your body really well, you may not. As you workout, as you progress, you learn more things about your body that you didn't know before. By that, I mean that in the first 2 weeks, I didn't really feel the core exercise in my core. The reason for that now, I realise, is that my core probably wasn't as strong as I thought it was, and when I was doing those core exercises, the surrounding muscles were actually making up for the lack of strength in my core. That's why I didn't feel it as much in my core (low core strength). After 2 weeks, the basic core strength has improved and now that my core's actually doing more work, I really felt it in the core today. On a more positive note, I completed all my intervals (random gesture of happiness). That's a really big thing because I hadn't done that for the past 2 weeks and to be honest it was bugging me because I thought I should be able to do them. It's been a while since I've done this type of training with high intensity intervals straight after a bodyweight circuit. Took me a couple of weeks to get used to it, but now I'm there I can really hammer it home. So I'll be pushing myself the rest of this week and the next week, which is the final week of this particular workout. So I really want to push it and get as much out of it as possible. So that's it for today, enjoy the speedy exercise mashup and I'll see you tomorrow, take care."